Where did your passion for seed start & how was Real Seeds born? We’ve been growing seeds for around 25 years now. We started when we realised that so many of the varieties available to home gardeners had been bred for the needs of large scale chemical farming. 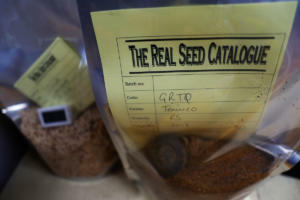 Originally we grew seed for our own use and to swap with other enthusiasts, and Real Seeds developed out of this. We started growing seed for sale in the late 1990s, and Real Seeds developed from there, moving to our current site ten years ago with offices in Newport in north Pembrokeshire and land a couple of miles away. We’re really pleased to be working with the Gaia Seed Sovereignty Programme. We have had a small network of local growers working with us for many years, and we’ve been keen to expand this but haven’t had the time given how busy we are in the growing season producing seed ourselves. Our regional co-ordinator Katie has done a fantastic job of seeking out potential seed growers, and bringing them forwards for training. We hope to have up to 7 new growers working with us next year, and as well as this our existing growers have benefitted from the training sessions and are much more confident about expanding their seed growing and trying new crops. Buying local seed has many advantages. Not only are you supporting local economies and environmentally friendly production methods, but you will get seeds that are more appropriate for your local growing conditions. We would also urge people to then go a stage further and learn to save at least some of their own seeds. We’re really pleased to have added Asparagus Kale seed grown by Debbie Rees at Blaenffos permaculture market garden near us in west Wales. Debbie introduced us to this kale a few years back. Asparagus kale leaves are good to eat throughout the winter, but the real highlight of this variety is the masses of exceptionally tasty flower sprouts produced during the hungry gap in spring. 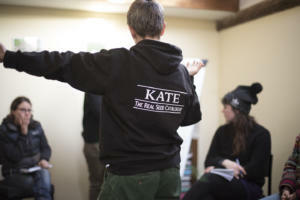 Real Seeds have been producing seed for over 17 years, founded by Kate and Ben. Real Seeds was born in Cambridge in the 1990s, before moving to Spain for several years and finally settling in Pembrokeshire, West Wales. They aim to assemble the best collection of reliable and interesting non-hybrid vegetables for the home gardener, allotment grower or smallholder. Over the years they’ve tried thousands of vegetable varieties and collected together what they believe are the best vegetables for the home garden. Due to these seeds being non-hybrid seeds, you can use your own seed for future use; there’s no need buy new ones each year! They sell a wide range of vegetable seeds including kohlrabi, fungi, tomatoes and Nasturtiums. To find out more or to order some Asparagus Kale seeds & many more for 2019 visit the Real Seeds website.